In India, there are many festivals held for the worship of Lord Krishna. There the year is divided into six seasons, each lasting two months. Among the six seasons, the most glorious is Vasanta, Spring. The Vasanta season is very pleasant, for the weather is neither too hot nor too cold at that time. An abundance of fragrant flowers, like beli, cameli, jui and others bloom everywhere, and flowers such as rat-ki-rani (‘night queen’) bloom even at night. Rivers like Ganges and Yamuna are especially clean and pure at that time, looking as though they are simply waiting for Sri Sri Radha and Krishna, and the lands in many places look like yellow carpets because they are full with varieties of yellow flowers. Krishna’s garments are also yellow, because his most beloved Srimati Radhika has a yellowish-golden complexion and he wants to be always embraced by her. Today is Vasanta Panchami, the beginning of the Vasanta season, at which time the Rasa Dance of Krishna was performed in Govardhana, in the village of Parsauli, by the lake known as Chandra Sarovar. At that time the gopis were dancing with Krishna for the duration of a night that became billions of years; it became as long as one entire day of Brahma. On that night the moon stood still, not moving from its best view of the sight of the dancing of Radhika and all her sakhis with Lord Krishna. Such beautiful pastimes were born from an ocean of rasas (sweet, transcendental mellow tastes), saturated with unlimited happiness. In Saradiya, the autumn season, the Rasa Dance was performed in Vrndavana, under the shade of the Vamsivata tree, in the beginning of Kartika month. All classes of gopis participated in that Saradiya rasa-yatra, whereas in this Govardhana Vasanti-rasa, only the highest class of gopis were allowed to participate. In this Spring Rasa Dance, Lord Krishna openly demonstrated the prominence and superiority of Srimati Radhika. Krishna disappeared in the midst of this Vasanti Rasa Dance, and all the gopis were bitterly crying, “Where is Krishna? Where is Krishna?” The gopis searched for him everywhere, and after some time they saw him in his four-handed form, standing like a statue. Coming nearer, they said, “Oh, he looks like Krishna, but at the same time he is not Krishna. Our Krishna is not four-handed. Where is his flute, his peacock feather, and all his other apparel gone? He now carries a conch shell, disc, club, and lotus flower – in four hands!” They prayed to him, “We are very attached to Krishna, and we are searching for him. We will die without him. If you are Narayana, please be merciful and tell us which way he went. Be merciful so that we may find him.” Then, after praying in this way, they left and went on their way. When Srimati Radhika was arriving after the other gopis had left that place, the breeze that had just touched her veil carried so much fragrance from her body that it entered the nostril of Krishna and he thought, “Oh, my most beloved is near.” He forgot that he was supposed to maintain his four-handed form, and he could no longer hide his original form. Two hands disappeared at once, entering his body, and his original two-armed form reappeared – with his flute in his hands and his peacock feather atop his head. 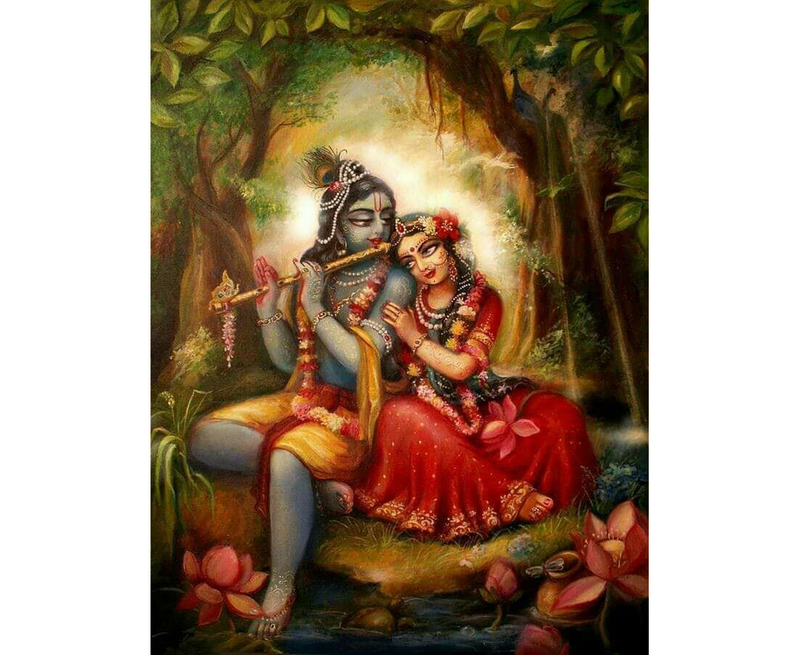 When Krishna sees Radhika, his most beloved and the embodiment of all love and affection, he forgets everything else. She is no one other than Krishna. She is Krishna himself, but in the body of Radhika. In this way, Krishna returned to his own form and quickly embraced her. This occurred in vasanti-rasa-lila. After that Raya Ramananda said, “One should take shelter of the lotus feet of Krishna,” and he quoted a verse from Bhagavad-gita: “Abandon all varieties of religion and just surrender unto me. I shall deliver you from all sinful reactions. Do not fear.” (Bhagavad-gita 18.66)] Krishna is saying here, “If you take the shelter of my lotus feet, you will be happy forever.” People all over the world think that this is the essence of the Bhagavad-gita, but Mahaprabhu rejected it as external and therefore not the ultimate goal of life, and he told Raya Ramananda, “Go on; continue further. In bhakti-rasa (intimate devotion to Krishna while thinking oneself in a relationship with him as an ordinary cowherd boy), Krishna is not anyone’s father or mother. In the understanding of pure bhakti, the Supreme Lord cannot be anyone’s father or a mother – he may only be a son. We can serve Krishna in any of four relationships, but if we think that he is our father or mother, we cannot serve him, because fathers and mothers serve their children. After hearing about these relationships, Chaitanya Mahaprabhu told Raya Ramananda, “Please speak further,” and Raya Ramananda then said, “Gopi-prema (serving Krishna as a beloved) is the highest attainment, and among the gopis Srimati Radhika is the best. When Mahaprabhu asked Raya Ramananda to give an example of a pastime that reveals Radhika’s supremacy, Raya Ramananda first gave the example of Saradiya rasa-lila. Sri Raya Ramananda then explained about this vasanti-rasa. He said, “Krishna was dancing with billions of gopis, and meanwhile Radhika thought, ‘Krishna always promises: “You are my most beloved.” But I see that he is dancing with me and all the other gopis as well; so perhaps we are all equal in his eyes.’ At that time Radhika adopted a sulky mood and became somewhat angry. She thus left the Rasa Dance in front of all the other gopis, and Krishna followed her. Mahaprabhu then said, “Oh, this is good!” and he questioned further, “I want to know about Krishna-tattva, radha-tattva, prema-tattva, and rasa-tattva from you.” When Raya Ramananda began to deeply describe these topics, however, Mahaprabhu stopped him and said, “Don’t say anymore. These subject matters are so elevated that there is no one in this world qualified to hear them. If you continue to speak about them, I will at once enter the mood of Krishna and I will have to give up this form of Sacinandana Gaurahari.” Raya Ramananda then stopped speaking. There is no difference between Srimati Radhika and Lord Krishna. Krishna manifested Radhika from his left side. If we can make Radhika happy, then Krishna will be happy and he will be controlled quite easily; and this is the purpose of our observance of vasanti-rasa.